This Sunday was the third annual Enchanted Rock Extreme Duathlon at Enchanted Rock State Natural Area, 30 minutes north of the historic, German town of Fredericksburg. This race features a five mile hilly trail run, a 16 mile out and back bike on hilly roads (with cows! ), and a 1.2 mile run – straight up Enchanted Rock. Actually, "run" is a bit of exaggeration, since very few competitors have actually managed to run up the whole way, perhaps as few as three people in the three-year history! My wife, Kat Hunter, and I have gone to this race every year, and this year was not just for fun – this was serious. In our three previous duathlons, I had yet to go faster than her. Obviously this could not stand, so this year I would have my revenge. Finally I had some solid run training before the event, so all I had to do was stay close on the run and pass her on the bike. No problem! The run starts nears the pavilion area, and we all gather for a mass start. Kat and I position ourselves near the front, where I notice a young woman ( Apryl Mortenson of team Tri-Sition) who looked very fit. "Look out for her," I whisper to Kat, who replied "I know." She already had her game face on, had already identified her main rival. This was going to be fun! The race starts and we all take off down the narrow trail. The first bit is relatively flat with a few rocks and stairs to navigate up and down. Then a quick run through the parking lot and back onto the trail, where it starts to get pretty steep uphill for about a mile. I pace myself on these uphills and Kat pulls away from me and her rival Apryl in the early going. I'm thinking Kat has the race won for a minute, but then when I look up again, Apryl has taken the lead! I'm not too worried yet. Last year the same thing happened when Monica Longlorai of the Texas A&M Tri Team threw down an amazing run time. Kat had managed to take the lead back on the bike, and I was sure she could do it again this year. I pull up alongside the guy just ahead of me. "We're getting chicked," I joke. He says, "Yeah, by TWO of them," but he says that he's used to it, that it's his wife up there. "Me too, my wife is the other one!" I say. I try to get some intel out of him by super cleverly asking, "So does she beat you on the bike, too?" He answers, "Oh, we're about neck and neck." Uh oh! Ronald Mortenson looked like a pretty fit guy, and was running a decent pace. If his wife could bike with him, Kat might be in trouble. "This could be a good battle then!" I say. My transition was uneventful and I was ready to get on the bike and crush it to catch Kat, then drop her with authoritah! However, my lack of run fitness seemed to be getting the better of me. While I could maintain a fast, steady pace, when I tried to shift into ludicrous speed, every muscle in my legs would start to scream. There were 16 miles of hills to go, then a run straight up a huge rock, so I didn't want to blow up yet. Ludicrous speed was not an option. I still managed to pass quite a few of those who outran me. Thankfully, I got ahead of all three Aggies (minor collegiate rivalry there, though I'm not a Longhorn, but an Owl). I was only passed by one competitor. As he pulled up next to me on a hill, I noticed his power meter and asked how many watts. "Three-fifty," he said. I kind of doubted that, but then he pulled away – far, far away, and I became a believer. Approaching transition, I became aware that I would not be catching Kat, again, this year. Her and her Cervelo P2C must have gone as fast as I had (wrong, she had gone minutes faster). Goals had to be adjusted – now I just wanted to podium in my age group and go as fast as I could. Off the bike, and onto the trail to the climb. Once again I decided I would try to jog the whole way up. Three steps later, plans had to be adjusted. The steep grade just makes one's heart rate instantly max out, and legs burn. I switch to hands-on-knees power walking, which serves me well. Regular park visitors along the trail look at us, wondering who these people are in funny outfits, sweating and moaning, barely going any faster up than they are. As you approach the summit, the grade finally levels off and you can manage to run again. This is convenient because the spectators at the top can't really see you below that point. So as far as they know you ran the whole way! Apryl Mortenson came in 2nd overall woman with a solid finish, and her husband Ronald had a strong showing as well at 2nd in his age group. Jamie Cleveland of Texas Iron, overall winner of the 2009 race, repeated in 2011 with another strong showing and was one of the few who actually ran up the rock. Kat and Jamie also won the King and Queen of the hill awards, for fastest male and female times up the rock. 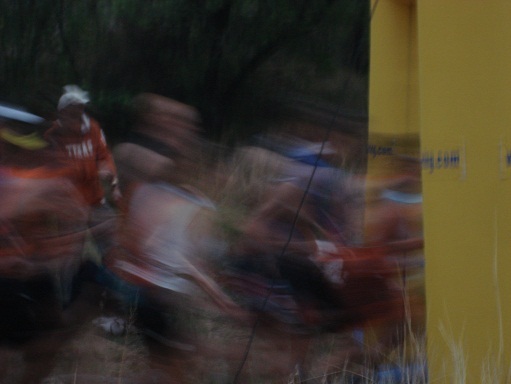 The Enchanted Rock Du is truly one of the greatest multisport events in Texas. The views at the finish line are amazing and there's an amazing atmosphere, great trails, and tons of good German food and beer to be had in nearby Fredericksburg. Also, our Texas state parks are one of our best and most under-appreciated resources, so what better way to help support them than by training, racing, and spectating at the great venues they provide? 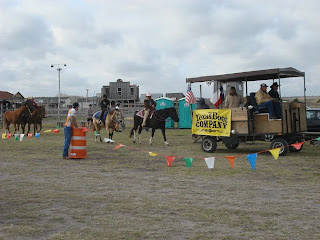 We highlighted three state park rides in a previous blog post. Add Enchanted Rock to your list. Cycling is huge in and around Fredericksburg, and the park itself offers superb running trails, rock climbing, hiking, and camping. Go there often enough, practice that run up the rock, and maybe you can be King of the Hill one day. 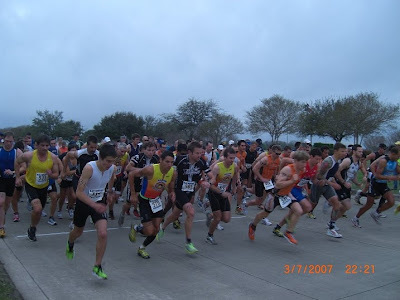 Special thanks to Earl Nottingham of TPWD for the race photos, and for his dedicated coverage of the event. (We have to note that, of course, the blurry photo of the race start was not the work of this professional, but rather, our own meager contribution.) 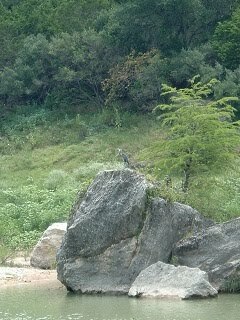 Look for more of Earl's photos and Kat's article about the race in Texas Parks and Wildlife Magazine in 2012. The thirteenth annual Fayetteville Stage Race – two long, lung-busting road races with the all-important, utterly lung-shattering 6.6-mile time trial sandwiched between. Put on by Houston's Southwest Cycling Club, the event is centered at "The Hall," and although there's no polka or square dancing (The Hall's general ambiance makes it seem like there should be), there's plenty of entertainment throughout the day if you like fancy bikes, fast riders, and know the names and lingo to follow the remote play-by-play from the announcers. Keep reading for links, highlights, and for starters, the highly intellectual perspectives of our four fearsome embedded reporters. 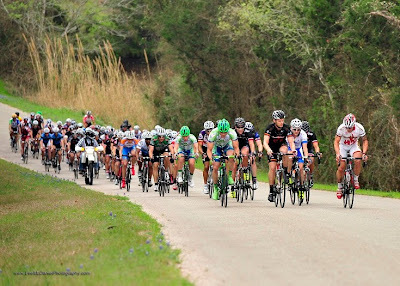 Gray Skinner, recently upgraded to Cat 1, finished 6th in the Pro/1 GC. There were 45 riders in the category, with Saturday's road race course set at three loops and 68 miles, and Sunday's at six loops and 95 miles. "The first stage started out fast, with attacks going from the start," Gray says. "This continued throughout the first lap with no group ever gaining more than a minute." But after the second lap, a group of three (Russ Walker, Steven Wheeler of Super Squadra, and eventual GC winner Scott Simmons of Velossimo) got away before the hot spot time bonus line. Then two more riders managed to escape near the feed zone – seven-time Tour de France rider and white-jersey winner Raul Alcala and local legend Brant Speed. The break was then five and would not be caught. Simmons, Alcala, and Speed stayed together until the end, with Alcala taking the stage and the trio gaining three minutes on the field. Gray tried to gain a few seconds at the end by taking a flyer at the 1k mark, but the fast sprinters caught him and he finished at 11th for the first stage. In the time trial, David Wenger had a dominating performance, taking the fastest TT time of the day with 13:53, the only rider to make it under 14 minutes. Simmons came in at 7th, and Stefan Rothe at 8th. Stage 1 winner Alcala, who rode a road bike, took 20th, conceding a full minute to Simmons. Speed, unfortunately, fell victim to a slow clock and missed his start by two minutes, finishing at 25th. Gray managed a respectable 6th after a warm-up that included 30 minutes of motor-pacing from his teammate. So the final stage was set on Sunday, with no one saving themselves for the long day ahead. The attacks came early. Sol Frost and Warney Crosby of Elbowz Racing broke away in the first few miles, and would stay away for the next 60, with a gap of 4.5 minutes at one point. "The break was caught around mile 70 and it was back to status quo," Gray says. "I put my fresh legs, courtesy of my teammate Sol, to the test with several attacks, trying to force another break. The leaders were quick to preserve their spots on GC, however, and no group was able to get very far." In the last ten miles, Gray attacked again, getting a gap for a short period with Alcala, but was brought back into the fold by hard riding from Speed. "I attacked again in a last ditch effort to gain some places on GC and maybe a stage win," Gray says. But Carlos Vargas was sitting on his wheel. As Gray drove on, with an effort comparable to the previous day's time trial, with 100 meters to go Vargas came off his wheel and sprinted ahead for the stage win. The gap to what was left of the field was 30 seconds, so Gray moved up to 6th on GC, and the top five came in together unchanged: Simmons, Alcala, Speed, Wheeler, and Wenger. A quick Cat 2 highlight! : Chris Trickey, of ATC-sponsored Team Wooly Mammoth, won second in the Cat 2 GC, and was part of a six-man breakaway on day two that put three minutes on the rest of the field. "The Saturday road race rolled out to nice weather but due to a weak pace ended in a 60 plus group sprint," Yancey Arrington says. At the end of the first day's 46-mile road race, he managed to navigate the minefield of dying riders for a 14th place pack finish. "Not a bad start." Since the time trial was scheduled later the same day, it played a big part in how the first road race went down for Cat 4, as well as most other categories – riders seemed to be saving up right from the beginning, unwilling to push the pace unless they were coming up on the time bonuses at the hot spot or the finish line. But perhaps that was for the best. On the time trial course, riders were faced with an unrelenting wind, rolling hills, and hot temps. For some, it took as much mental staying power as physical to keep the pace strong until the finish. In the TT, Steve Quick of Shama Cycles came in at 15:19, which put him nearly 45 seconds ahead of the field in GC contention. Our embedded reporter extraordinaire snagged 7th with a 16:03. "Only five seconds separated 2nd through 6th places in the time trial and the GC standings were shaping up to be a game of seconds," Yancey says. The Sunday, 49-mile road race was a three-loop course, and Yancey says this race was nearly as uneventful as the first for the Cat 4s. "Hard accelerations up the hills and out of the corners split the field in half by the 3rd lap, but the peleton hive mind never let any breaks dangle more than 20-30 seconds down the road before pulling them back." And then about four miles from the finish, at a point when the pace was about to start weeding out the pack further, the Cat 4 lead group had to allow another category's break and pack to pass, which provided a few precious minutes of coasting for everyone's legs to refresh. The finish was a 30-40 person sprint, with Yancey coming in at 12th with a pack finish time. The weekend's efforts were enough to get him 5th in GC, along with a sweet $50. This was our Cat 5 reporter's first stage race, but his strategy was simple – stay with the front groups for both road races and dominate in the TT. "Mission accomplished so far as I finished with the front group and the same time," Jack Mott says of the first road race. "The only tactical error was riding 2nd wheel for quite a long while on the approach to the finish. This was a bad setup for the sprint and I had to really dig deep just to say with the pack." His right leg cramped, and he was worried that would come back to haunt him in the TT. The winds gave his front wheel a few wiggles, but like any good triathlete, Jack stayed in the aero bars and hammered on until the finish. 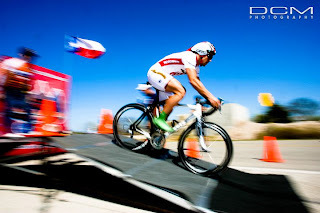 He came in with a solid third place, putting enough time on the first road race's winner, Edward Dominguez of Team Nick Lopez, to overtake his time bonus, as well as to get far enough ahead from fourth place to be safe from any time bonuses on day two. First place in the TT was James Perrin of Team Bike Barn, who "put on a clinic," beating the rest of the field by a minute, and second place was Stuart Page of Shama Cycles, who'd been riding hard at the front for a good portion of the first road race. So alliances began to form, boasts were made, and Jack's new strategy was to hold onto his third place spot for dear life, and just stay with the front group on the 2nd day. No problem. "Big problem," he says. "From the very start of the race Edward was on the attack, with teammate Carlos Barrios, who was then 4th in GC, working well with him. Edward and Carlos took turns attacking, and a few short-lived breakaways got away." Jack had agreed to work with Perrin and the Bike Barn team to hold off the attacks, and they did a reasonable job of it...in the beginning. After Jack's rather ill-advised aero water bottle setup ejected his bottle to the ground, he offered to pull back the current breakaway for Perrin in exchange for a few drinks of water. But then Dominguez and Barrios attacked together, and since they were 4th and 5th in GC, Jack felt he had to chase. And because Jack chased, Stuart Page was also compelled to attack to protect his 2nd place position. So a four-man breakaway with real staying power was born, gaining a lead on the main pack by 45 seconds. Jack assumed Dominguez would tire from the endless attacks and ease up, but as Page put it so aptly later, "No, Edward doesn't get tired." Jack went from cooperating to just sitting in, but the pace was so furious that he finally just dropped off to see if he could work with Perrin to bring the escape group back. But by then only about eight remained in the chase group, Perrin had lost the rest of the Bike Barn team, and even Perrin's cries of "Come on, work! Remember the water!" couldn't inspire Jack to keep the pace. Perrin eventually tried to bridge the gap solo, but didn't get far, and Jack drifted back into no man's land, his podium dreams disappearing. "I felt terrible for James and it was awful to lose 3rd place, but I felt like I experienced an entire Tour de France of action in one weekend, a great time, and plenty of suffering," Jack says. Dominguez and Page's breakaway survived, with Page giving Dominguez the stage win in exchange for the help in getting Page the overall GC win, and a deserving one. Page had been at the front for the first day, put down a killer TT time, and worked like crazy in the break on day two. So sometimes the hare does get the prize, after all. 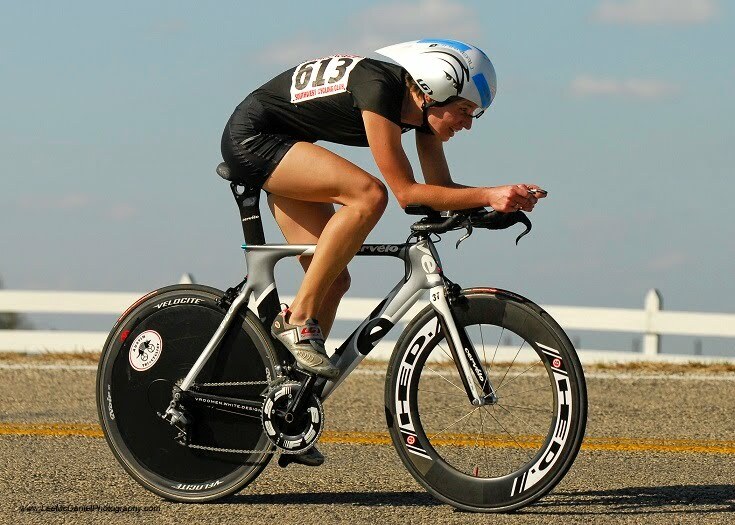 This one's me – the time-trialing triathlete, sometimes referred to as the "f---ing triathlete" (overheard at a TT results board a few years ago). People still come up to me at cycling events and say, "Hey, so you're the triathlete." I love triathlons, but I perform better at duathlons and time trials, and have done probably three times as many. Still, I suppose there are worse things to be called than "f---ing triathlete." My middle school basketball coach called me "Big Girl." Courtney Lowe, a newcomer from New Zealand and member of the FCS/Metro Volkswagen team, was undoubtedly the star of this weekend's stage race. In the first road race, she took off on a solo breakaway only a few miles from the start ("Ah ha," I say to myself, "that is what you're not supposed to do," and I overhear a scornful comment from another rider, "Wow, someone's already going?"). But then Lowe kept it all 46 miles, coming in a full ten minutes before the rest of the pack. For the rest of us, the first road race was slow – sometimes painfully so, with a lot of soft- pedaling at the front – but the "hive mind" was saving up for the time trial. It was a miscalculation. The TT might decide the rest of the GC, but a ten-minute lead? I don't think there were any illusions about first place after that. The rest of the field finished mostly intact, with a dead-out sprint at the end for the line and a pack finish. One might assume (I did) that Lowe would be tired after her 46-mile solo effort, but she also took first place in the TT with a blistering fast time of 16:09. Louise Smyth of Team LaS'port was 2nd, Lauren Robertson of FCS/Metro Volkswagen was 3rd, and Amy Gray-Smith of Pro Design Porsche Bike Source was 4th. I came in 5th, knowing when I crossed the line that I hadn't pushed it enough. I berated myself for the slow cornering and general lack of moxie, but in my heart of hearts I knew that even on a better day I couldn't have shaved 31 seconds off my time for first, not in six miles. Sunday's road race was another schooling. Fellow newbies, please note that on a steep hill, it doesn't matter where you are, so long as you're in a position where you can escape if you need to. Otherwise, you're throwing on your brakes to avoid smashing into the rider slowing up ahead of you, watching 10 of the lead riders (suddenly and ferociously accelerating) split the pack in half and leave you in the dust, and then chasing them for miles in a solo TT that you know you can't really afford. When I caught the lead pack, I was done, but they weren't. It was attack after attack, a night and day experience from Saturday's race. I doggedly hung on to the back, wishing, in fact, that I had given up, because then the pain would have been over. My goals at the beginning of the race – making up time by getting a time bonus, maybe trying to break away at the end – were very much readjusted by mid-race. I just wanted to finish with the lead pack. And that was shaping up to be a real accomplishment. 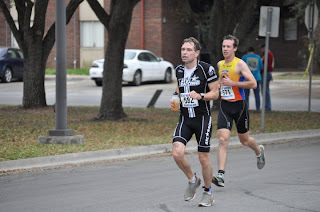 I was out of water about halfway through the race, and hadn't brought any food. I was, in short, feeling completely miserable, so unlike the first day ("when-are-we-gonna-catch-her-dang-it, when-are-we-gonna-go..."), I didn't care when the first solo break came from Kate Chilcott of Metro Volkswagen, nor when just as we were about to pull her back, Lowe joined her teammate and they rode out of sight. By the end, I had suffered enough to pat myself on the back for simply catching up with the lead pack (even if falling off was my own mistake) and then staying with them to the finish. Lowe and Chilcott ended up taking the stage win by 3.5 minutes, and the FCS/Metro Volkswagen team took all first three spots in the GC (with Lauren Robertson in 3rd). Their team effort was nothing short of amazing. Many thanks to SWCC for putting on a great race! Have something to add? Email us at atcblogs@gmail.com. If you didn't race this past weekend, you missed out. Good weather, great courses, friendly people, expert organizers, and the local superstars, aero-helmeted and out to crush your dreams – you have to love a city where you can race twice in a weekend, and some months twice every weekend, within an hour's drive. Yesterday the 21st annual Seguin Sunrise Lions Club Blue Norther' Duathlon, a long-standing ATC favorite and one of the first races of the season, was held at Texas Lutheran University in Seguin. The 3.1-mile run/14-mile bike/3.1-mile run event is small (at about 150 participants), but attracts many of the fastest age groupers in the area. The run course is two loops, on quiet campus and neighborhood streets, and the bike course is gently rolling, with very little traffic. It's the perfect setting for an early season test run for your equipment (and person), and an all-around good time. Post-race, they served up snacks like baked potatoes and homemade chocolate-chip cookies, along with a healthy dose of small-town hospitality (volunteers don't get any friendlier than this) and live bluegrass music. The top three in each age group took home a medal. (Click here for results.) Matthew Russell was first overall male at 1:08:40, with Weslie Anderson coming in second overall about a minute later, and Tony de Silva at third a minute after that. The top three women finishers were Kat Hunter, Marla Briley, and Erin Anderson. But perhaps more importantly, the ATC smack talk finally came to proving time. Corey May bested the rest with 1:17:41, taking first in the 40-44 age group. Adam Stroobandt came in second of the ATCers, and first in 25-29. Flu-stricken (we'll be kind) Don Ruthven was third in the rivalry and his age group. Tim Dove was fourth, and first of the Clydesdales with a 1:21:43. Not quite a party to the rivalry and heated debate, but in the ATC jersey were Missy Ruthven and Rita Stroobandt, competing as a relay team, with Missy on the bike and Rita taking the overall female lead for both runs. And Tony de Silva, third overall, and John Trowbridge, first in the 45-49, were racing for ATC, as well. All proceeds from the Blue Norther' and other Lions Club projects go to charities, including the Seguin Women's Shelter, EATS food bank, Teatro de Artes, scholarships for Seguin high school seniors, and other local programs. Big thanks to the volunteers and organizers who are out, year after year, making this event run smoothly! And thanks to Chris Garlington, Thomas Bressie, and Sara Askey for the photos! That "good weather" we mentioned doesn't exactly apply to the Cronometro. The day was warm, but the wind was strong enough that even Mary Poppins would have balked at a deep wheel. Still, many riders had them, with the first overall male finisher and female finisher on HED Stinger 9 fronts and disc rears. Like the Blue Norther, the Cronometro is a race with character. And you don't have to be the fastest of the fast to enjoy the atmosphere and the company. The time trial's start is at J. Lorraine Ghost Town in Manor, a collection of Old West replica buildings, complete with a saloon and a jail with squeezable bars. This year, the first 100 to register got a free "Ghost Burger," and a live band played on the outdoor stage. And the post-race isn't a lengthy award ceremony, but a never-ending raffle of prizes (stick around and you're almost certain to get something, if not multiple somethings), like Tifosi sunglasses, Polar bottles, Pure Austin gym memberships, and Driveway passes, just to name a few. The best part about the Cronometro? A trail ride leaves from the same location earlier in the morning, so while you're unstrapping your P2 from the roof, cowboys in full chaps are saddling up their horses and readying the wagons. Two beautiful, slightly antique modes of transportation and a ghost town - can you get much better than that? Sometimes the best rides are the ones that go somewhere. Austin is a great hub for state park visits, so check out the routes below to get in your workout and see more than just the pavement. All routes are from MapMyRide users, so starting points differ. For distance, we use an approximation from downtown Austin to the park. This route takes Fitzhugh Road – pretty scenery in itself – for roughly 20 miles. You can also tack on some extra mileage on the park roads. To see the falls area you'll need to walk a short trail, so bring a lock and a pair of shoes with you, or plan to carry your bike half a mile or so. There's also a swimming area in a separate part of the park – again, you'll need to walk a little to get there. The river is often very shallow, so don't expect to get your swim practice in. The falls area is worth spending some time exploring – there are lots of fossils, interesting rocks and eddies, and climbing around. The swimming area is typical Hill Country river, with cold, clear water and old cypress trees lining the banks. Fitzhugh doesn't have a shoulder, so it's best to start early or on a weekday. This park is a great place to take the family or a beginning rider. 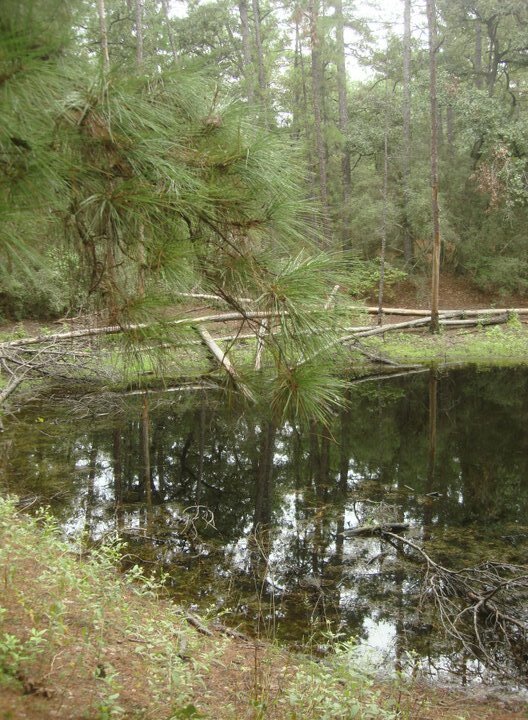 The paved, rolling road from Bastrop State Park to Buescher State Park is about 12 miles and has very little traffic – it's just you and the "lost" pines. Within the park there are many good running trails and a few CCC-built cabins that make a nice overnight stop. 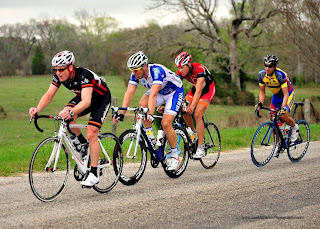 Or if you're looking to spend more time in the saddle, the 80-mile route takes the back back roads to Bastrop. 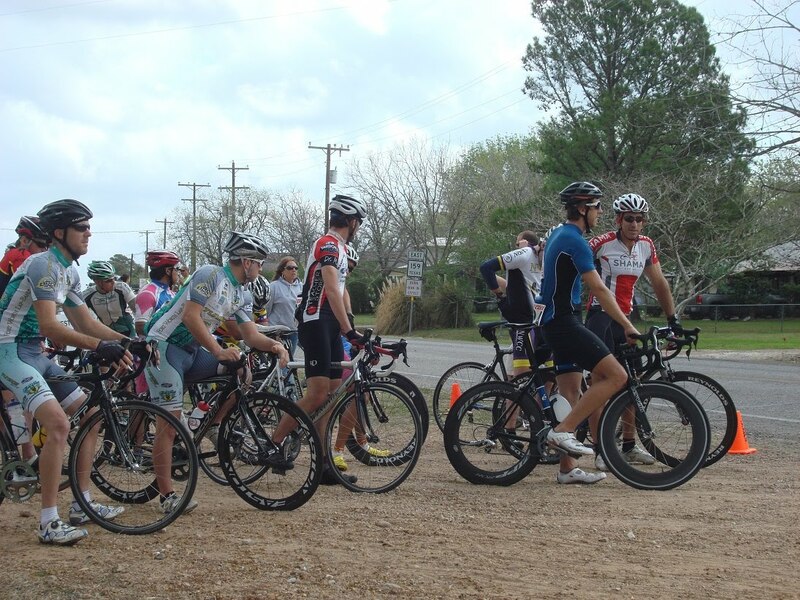 Leave the race wheels at home, though – you may encounter some unpaved portions. And plan to meet some unfriendly dogs, as well. This ride is fairly short and not scenic at all, but McKinney Falls is the closest state park to town, and offers great running trails and a good swimming hole. The swimming area is, again, too small and shallow for open water training, but it's perfect for cooling down mid-ride in the summer. More than 90 percent of Texas is privately owned, so every green spot on the map is something special. With the current budget crisis, the axe is coming down hard on all state agencies, the Texas Parks & Wildlife department included. If you like your state parks and other green spaces, the best way to keep them around is to use them.